Google’s Android operating system is the most popular smartphone OS in the world. That is, there are more Android devices than iOS devices, WinMo devices, and Blackberries. This was always the nature of Android: to allow for the spread of the OS to many devices on many carriers in many countries. Great plan. Though this distribution model has left Android critics and fans alike shouting the same word over and over for nearly three years: fragmentation. Currently, there are 10 different versions of Android running on different handsets across the globe, and with the roll-out of recently announced Jellybean scheduled to start later this month, than number will soon be 11. Is fragmentation a real problem, and if so, who does it negatively affect? 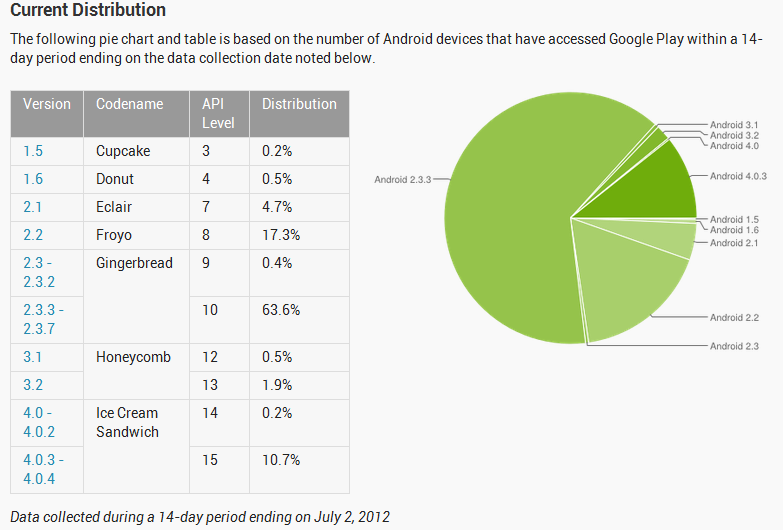 Also, will Android 4.1 finally take a bite out of the fragmentation issue? Let’s find out. The graph above is from Google’s own Android developer site and depicts the current distribution of users per Android version, as of July 2, 2012. The most telling and frustrating numbers here are those found at the bottom of the chart. 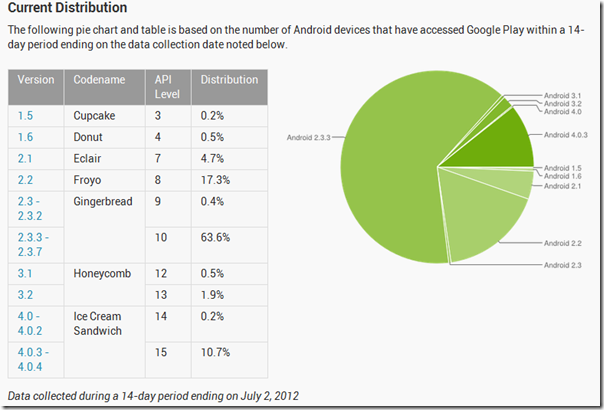 As of July, Eight whole months after the release of Ice Cream Sandwich (Android 4.0) only 1 in 10 Android phones utilizes the latest OS iteration. Sure there are still millions of people using older hardware, but a majority of Android users with version 2.3 are using phones less than 18 months old that are late to be updated for one reason or another. There are many things that can prevent a device from being updated to the latest version of Android. Some phones still in use were built two or more years ago and are limited by processor speed, resolution, battery capacity, etc. and thus are not suited for the newest OS. Other devices are hampered by their carriers, who fail to make their networks compatible with new OS versions in a timely manner. But perhaps the biggest hold-up in getting updates comes from the phone manufacturers themselves, especially those who utilize custom user interfaces, or “skins”, with their Android phones. The three biggest Android manufacturers, Samsung, HTC, and Motorola, all have custom UIs that change stock Android in one way or another. These UIs are built on a case-by-case basis for each device and sometimes can heavily alter the source code for “stock Android”. Whenever a new Android OS is released, developers at Samsung, HTC, and Motorola have to work to update their user interfaces for each device. The most recent, biggest selling devices get preference, and the others (sometimes) eventually follow suit. Though I believe there are some serious ulterior motives going on in the labs and offices of the major 3 Android manufacturers. Think about it: if a user is willing to update his handset early in order to get his hands on the newest OS, why should the companies spend money to get the latest OS to customers who aren’t going to buy a new phone for months. I believe that HTC, Samsung, and Motorola are, to a certain degree, deliberately holding out on updating their Android devices in hopes that user get fed up with waiting and eventually buy a new phone out of contract, without subsidies, for upwards of $500. Though I can think of no adequate way to validate these beliefs at this time. Is Android Fragmentation a real problem, and if so, for whom? Sameer Singh for Android Authority put out a wonderful in-depth piece on Android fragmentation back in April in which he uses several analytic techniques to determine the actual effect of fragmentation on the ecosystem. He concluded that Android fragmentation isn’t nearly as big a problem as it’s made out to be, and that while the problem is worse on Android than on iOS and WinMo, it is nowhere near as bad as in Windows computers. Singh pointed out that while it takes months for a new Android OS to claim a major stake in the OS distribution, it can sometimes take years before a new Windows version has overtaken its predecessor. Do people complain about fragmentation with their Windows computers? No. Well, at least not that type of fragmentation. Still, others hold that Android fragmentation is a real problem for app developers and consumers. That’s why developers like Animoca have invested what I can only imagine is a sizable amount of money and effort testing their apps with something like 400 Android devices before pushing them out into the world. And of course, fragmentation isn’t just a hardware issue — the OSM post points out that the two most used versions of Android now only account for 75% of the devices they surveyed, down from 90% last year, yet another issue for developers to grapple with. Think about how resource and time intensive it must be to develop for 400 devices. It’s easy to understand how many people claim iOS apps are more polished and better developed when you consider how impossible it would be to perfect Android apps for each device and software combination. Also, when developers suffer, so too do the consumers. With so much fragmentation among Android users, everyone seems to know of a particular app or service that won’t work on their device. Not only do Android users suffer from lackluster and broken apps and features, but also they suffer from a lack of support from developers. If a given developer has to learn 400 devices a little bit, it is hard to expect her to know one device-software pair really well. If you’re an Android user and are experiencing difficulties with an app, there is a good chance that none of the developers with the app’s company will be able to help you with your specific handset, so they’ll refer you to your carrier. Your carrier will probably just tell you to uninstall the app. Awesome. Thanks. What a big help. Will Jellybean finally solve Android’s fragmentation woes? In case you missed it, Google only listed a few “Nexus-class” devices that will receive Jelly Bean in July: the Nexus S, Galaxy Nexus, and Motorola Xoom. To get beyond that, we reached out to several OEMs and most have given some variation on “no comment” when it comes to upgrading current devices to 4.1. Acer, Asus, and HTC all declined to comment on whether (to say nothing of when) 4.1 would arrive on their devices — though HTC did say “Watch this space for more information.” LG told us it is evaluating Android 4.1 for current devices, but doesn’t have anything official to announce. As of this writing, we’ve not yet heard back from Motorola, but will update this article if and when we do. Singh’s Android Authority piece mentioned a 6-9 month difference between new Android version announcements and the time it takes for the OS to reach a substantial number of users. And the major Android manufacturers haven’t been quick to announce they’ll be bringing Jellybean to us anytime soon. If you want to stay up to date with Android OS versions, you’ll need to have the newest Nexus devices. Otherwise, there’s really no guarantee you’ll ever have the latest. Google and the phone manufacturers have been sending us this message for a while now. The fact is, all of these companies are in this for the money, and spending to update the phones of people who aren’t forking over new money doesn’t seem to increase the bottom line for anyone. There is a market for low-cost smartphones with little upgrade support, and so Google and these manufacturers will cater to that market. If you want the best, beefiest, and the latest, you’re going to have to purchase a top of the line device. So will Jellybean fix the fragmentation problem? No, because fragmentation is not a problem for the people who make the big bucks off Android. Next:Which Anti-Virus software is most popular? This will never be fixed!!! The customization necessary to stock android to an specific device always be needed and this always get a delay (sometimes eternal) caused by cell phone manufacturers (sometimes caused only by delay, others times by the real wish of “no upgrade” to force costumers to buy another cellphone. Well this certainly has me considering upgrading to an iPhone rather than an Android device. Honestly Steve, I am kind of thinking the same thing. I am going to wait until the next iPhone is released and compare the latest Android, iOS, and Windows Phone devices available at the time. If you want the latest Android OS, (the admittedly short) history suggests you’ll have to buy another Nexus phone every 18 months.